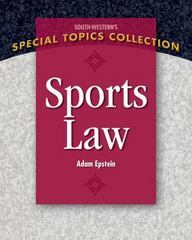 Sports Law 1 Edition Sports Law by Adam Epstein brings the multi-billion dollar business of sport to the classroom. Epstein's book delves into the world of interscholastic, intercollegiate and professional athletics by exploring various categories of law and its relationship to sport. In addition to providing an examination of the history of the NCAA, this textbook examines relevant NCAA cases along with excerpts from the most recent NCAA bylaws in chapters throughout the book. This aspect of the text is particularly helpful for those who have an interest in pursuing a career in college sports. The book begins with an examination of the most current cases and regulations governing sports agents and how such individuals have helped to shape the sport business. The author also provides the best discussion on the importance and role of contracts in the sports industry with an exploration of various sports contracts and special contract clauses. Along with the aforementioned topics, Sports Law dives into other important legal topics in the sports industry including torts, crimes, Title IX and gender issues, social media concerns, disability issues, antitrust and labor issues involving leagues and their player associations, an examination of international issues including the Olympic Movement and more. Epstein provides abridged cases involving Andy Oliver, Jeremy Bloom, Coach Jim O'Brien and others. Sports Law brings the dynamic and exciting world of sports law to the undergraduate and graduate student.